Boise, ID – Firefighters endured another long night on the firelines working to keep both the Elk and Pony Complexes at bay. The plume-dominated Elk Complex is now estimated at 80,365 and 0% contained. Both ground and air resources employed strategies and tactics to battle the fire east of Prairie towards the landing strip. Late yesterday, the fire moved into the Lester and Fall Creek. 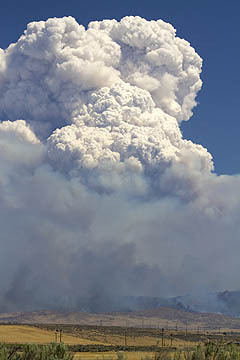 Pyrocumulus cloud tops wildfire east of Boise near Mayfield. This morning it is reported that the lodge in Fall Creek and approximately 20 structures have not been damaged by the fire, but it is believed there is structure loss further up the drainage. The Lester Creek Guard Station has not been damaged. Fire officials hope to gain access today to assess the situation if conditions allow. A 600 acre spot fire occurred late yesterday on the north side of the South Fork Boise River in the Rock Creek drainage. This is a concern as the fire may move north out of the river corridor and effect areas west of Prairie. The Elmore County Sheriff’s Department as of this morning is notifying residents from Johnson Bridge (about half way between Pine and Featherville) south to the junction of the Pine/Featherville Road and Highway 20 that they need to leave the area. Campers are also currently being requested to leave. The fire situation and potential for growth will be evaluated as the day progresses regarding further evacuation needs. The Sheriff’s office has established a road block at the Pine/Featherville Road and Highway 20 junction. A public meeting is scheduled in Pine at the Pine Senior Center tonight at 6 PM. The Pony Complex experienced extreme fire behavior yesterday and the fire is now estimated at 100,090 and is 10% contained. Crews conducted burnout operations in and around dispersed residences and ranches in an attempt to stop the forward progression of the fire to the west near the community of Mayfield. Currently, the fire has reached the Blacks Creek Road. The Danskin Lookout was evacuated and retardant was used to protect the structure. An unknown amount of cows and sheep, that are associated with Forest Service allotments, are missing/unaccounted. A public meeting is scheduled for this evening at 6 PM in Mountain Home at the Elk’s Lodge. Fire officials from the Elk Complex also will be present at the meeting to provide an update. The American Red Cross has opened an evacuation shelter at the Good Council Hall in Mt. Home for any residents that have been displaced due to the fires. The Boise National Forest has initiated a large area closure that extends roughly from the Pine/Featherville road on the east; Forest Road172 and the William Pogue Trail to the north; the Middle Fork of the Boise River to Arrowrock Reservoir; then extending south along the forest boundary to the north side of Anderson Ranch Reservoir. Additionally, the Trinity Lakes Recreation area is closed. The Middle Fork of the Boise River Road is open. For specific information and a map, please visit http://inciweb.org/incident/3616/. Stage I fire restrictions remain in effect including using a campfire outside of an agency designated recreation site until further notice. For more information, please visit www.blm.gov/id. There is a Fire Information Center established in Boise which will be staffed from 7 AM to 7 PM., and the center can be contacted at 208-384-3266. Personnel at the center will be able to provide general information on large fires in the area.